I had an opportunity to talk at two great events at the end of 2012. Given my transatlantic move and transitioning into a new role at SapientNitro, I’ve only now come up for air to write about them. The first event, UCD2012, took place in London in November. Five of the UK’s most influential professional organizations teamed up to offer this unique User-Centered Design conference. UCD2012 explored how User Centered Design is applied in a variety of disciplines and contexts. The conference focused on leading UK based speakers (I was UK-based at the time). 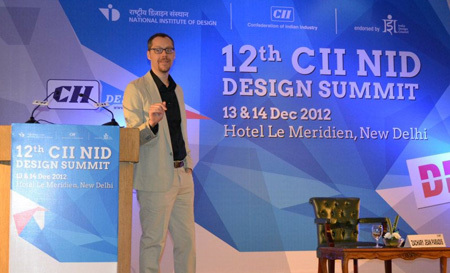 The Confederation of Indian Industry (CII) and India’s National Institute of Design (NID) organized the second event, the 12th annual CII-NID Design Summit. 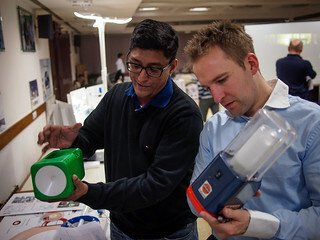 The 2012 summit featured some of the best Indian and international design thinkers, practitioners and design supporters exploring the theme of “Design Doing”. We all want to advance our practice in design and user experience. As different methods are introduced, our approaches evolve. In the product world, that meant singular mastery of shape and form evolved to ergonomics and human factors, which shifted to user-centered design then the design of “experiences”. In the digital world, web masters became web designers, splintering into visual design and information architecture, which was broadened to “experience design” and some people talking about “Lean UX”. Simultaneously, product development and project management have evolved. A world once built entirely around waterfall processes, classical engineering and Six Sigma, shifted to more agile ones with labels like “Scrum” or “XP”. In Japan and elsewhere, manufacturing became “Lean” and, more recently, with the proselytization of Steve Blank’s thinking on customer development and the introduction of Eric Ries’ excellent book, everyone’s talking about how start-ups need to be “Lean”. The approach one advocates typically depends on a number of factors: education, experience, the type of organization we work for, and the current blog being read. The reality is that what is most often advocated is either the most familiar or new. Each approach reaches a “New Black” status with a breathless set of fan(atic)s. Whether “New Black” fanatic or traditionalist, practitioners tend to propose a single approach–the notional hammer–regardless of the problem. In fact, it is actually much more important to talk about approachesrelative to problems. Just as it would be madness to use a hammer for every physical building project, it would be equally so to use the same approach with every design or UX project. 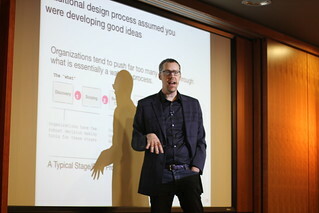 The talk refined content from the Evaluation chapter of my book, Naked Innovation, seeking to introduce a world where “Design Planning” precedes “Design Process” resulting in a portfolio of multiple approaches aligned to multiple problems. Needless to say, this thinking will be introduced in the next version of Naked Innovation, to be completed in early 2014. Before then, I’ll try to get a version of the presentation up on Slideshare with an accompanying presentation audio track. 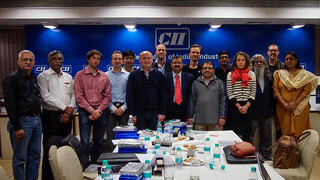 While I was in India, I also had the honor to be on the jury for the CII Design Excellence Awards 2013. While only the second year a major national design prize was awarded, it is clear India is getting serious about design. During the conference, it was quoted to me that ten years ago there was only a single design school in all of India, the well regarded National Institute of Design. Just a decade later, there are now over 40 schools. That there are only 40 schools in a country with more than 1.2 billion people is still pretty shocking. Nevertheless, we can be sure both the quantity and the quality of design will rapidly increase. Entries for these awards is a testament to that. My personal favorite of the competition was the incredible ECCODiva multipurpose LED light and solar charger. Designed by Dipendra Baoni and his team at the multifaceted lemon design, the ECCODiva is a refined product which could easily look in place in the world of high design as well as in a small village with no power. Its strong looks are backed up by incredible ergonomics, usability and engineering which includes an embedded processor to extend its functionality. It is an incredible piece of design. Here’s a picture of fellow jurists Abhijit Thosar and Paul Hendrikx evaluating the ECCODiva (on the left) and another competitor. Of course one of the most excited things about judging awards is interacting with fellow jurists. I was lucky enough to interact with a rock star group of designers from India, Sri Lanka, Finland, the UK, the USA, the Netherlands and South Korea. It was a tremendous experience.